This sample destination honeymoon registry can be used as a guide when completing destination wedding or honeymoon registry entries with our travel agency. Give our travel agency a call and we will be happy to give you any additional help you need to create your personal destination wedding and honeymoon registry. Please note - this is a sample page. 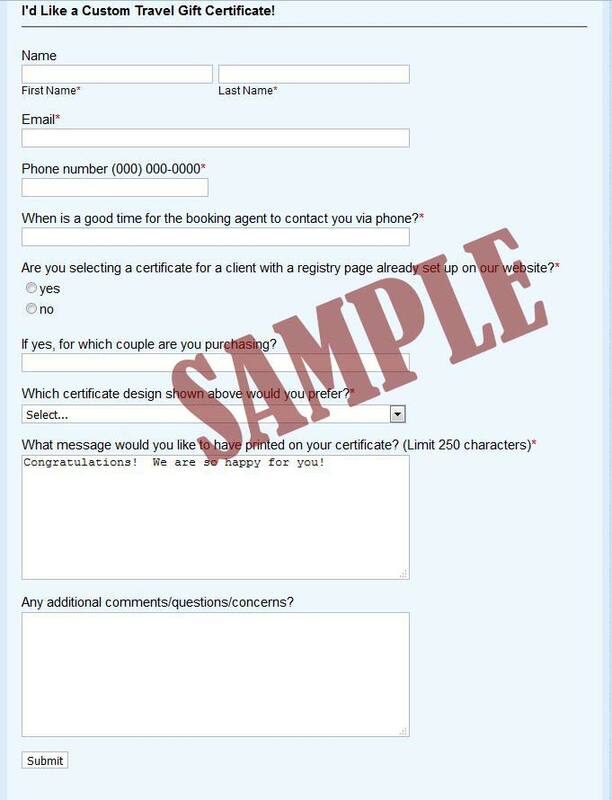 To maintain your privacy, your honeymoon registry will NEVER be publicly linked to our website. You will be given a personal link in which only your guests will have access. 1. Contribute toward the total price of their honeymoon package. 2. Sponsor one of their chosen excursions/activities! It's easy - simply fill out the form below. Then, their booking agent will contact you and get your credit card information to make the payment. Be sure to check out our gift certificate design options and share your gift in style! Please note - when your balance has been paid in full and all excursions are booked, this is what we will post on your registry page: Their honeymoon and excursions are now paid in full. A great way to help them with their trip at this point would be to send them a personal check that they can use toward the purchase of souvenirs, a honeymoon photo album, spa treatment, or other use on their honeymoon as they see fit. Thank you for wanting to assist in making their honeymoon a fabulous experience! The registry allows you to gift any part, or portion of any part, of the honeymoon expenses or activities selected by the bride and groom. Our travel agents are always ready to help and answer any questions about the registry process.